The Potions badge is for Monster Rangers who are good at mixing concoctions and potions of many sorts. Great for Monster Medics and Conjure Guard especially. There is but 1 level of the Potions Badge, though that’s certainly enough. Don’t drink the green stuff. The Potions Spirit Badge is worth 10 Glory points. 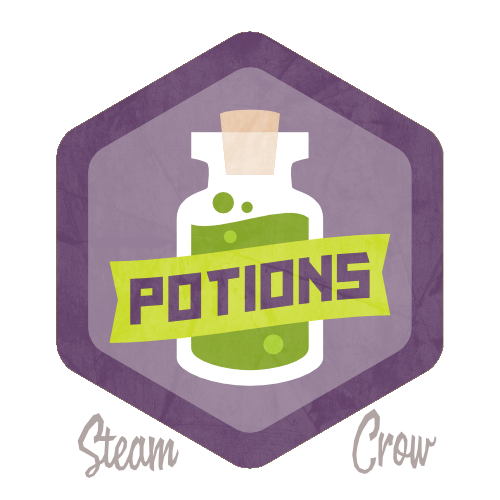 Potions symbolize our ability to concoct a solution to most any problem. This is a common badge. Get yours here! You don’t turn this in for credit; you simply log the recipe into your Ranger Sketchbook.